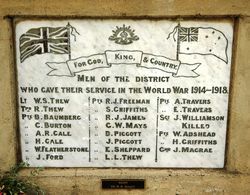 The War Memorial commemorates those from Rydal and district who served in World War One. 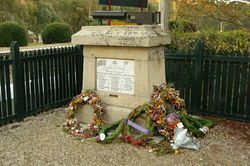 The unveiling of the war memorial at Rydal was carried out in the presence of a large gathering at the railway station, on Saturday afternoon, by Major Milne, assisted by the Rev. Mr. Hope, of Lithgow, Rev. Mr. Little, of Portland, and Mr. J. Charlton, who represented the Church of England. The Rev. Mr. Hope occupied the chair, and opened the ceremony with the singing of the hymn "Oh God, Our help in Ages Past." After addresses had been delivered by Rev. Mr. Hope, Rev. Mr. Little (both Diggers) and Mr. J.Charlton, Major Milne, D.S.O., unveiled the memorial. Wreaths were placed thereon by several citizens. Among those present were Mr. and Mrs. W. Thew, old and respected residents of Rydal, whose three sons responded to the Empire's call, also, Mr. E. Lennon, of the Royal Fusiliers, who was in the battle of Mons and is very proud of his medal obtained in that connection. The marble tablet contains the names of 22 men who enlisted from Rydal and district, 19 of whom returned, and three who made the supreme sacrifice. The machine gun is of German make, and was captured by the 17th battalion in the 11th August, 1918, at Atraincourt in France. One of the wreaths consisted of ivy grown by Mrs. R. Mays of "Rose Hill," from a small piece sent her by a soldier in England from Shakespeare's monument in London. Lithgow Mercury (NSW), 25 October 1922.
Who Gave Their Service In The World War 1914 - 1918.